Google rolling out a new update to Hangouts, which includes GIF Keyboard support for Hangouts on Android 7.1 devices and few bug fixes. The update which bumps the app to version 15 allows users to send GIFs and spruce up your daily conversation. In order to get to the GIF keyboard, you will have to open the emoji panel and look for the GIF button to the right of the space bar. You can search for GIFs ranging for various situations. 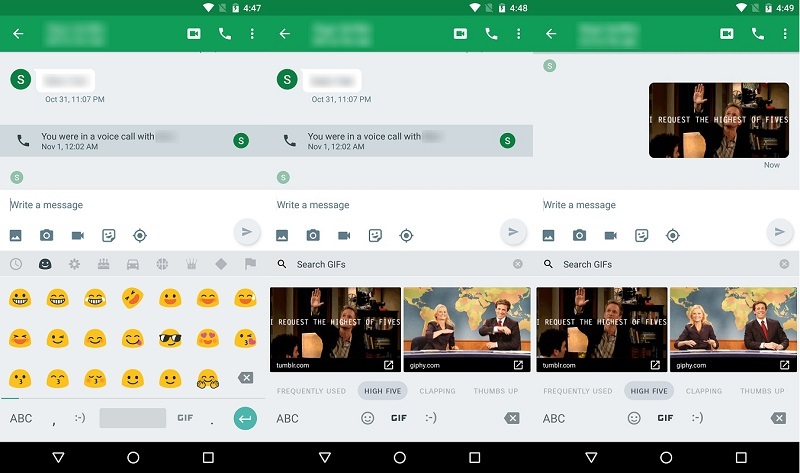 The GIF keyboard works for regular Hangouts and not for Google Voice messages. The GIF keyboard first landed in the Android 7.1 Developer Preview a few weeks ago on Google’s Messenger app. Along with GIF support, the latest update also fixes the bug from 14.0 that was showing the sender of a single person’s name twice in notifications.